Please note that as of 2/5/2018 the host support section has been closed. Before you read any of this; It always helps to do a FULL restart of your equipment. Restart your computer, your router, your modem and anything else connected to see if it improves your situation. See the very bottom for a TLDR if you're truly that lazy and have no interest in learning things. DNS = Domain Name System or sometimes Domain Name Servers in specific contexts. So you find yourself experiencing "lag" or "desync" frequently, or even infrequently. The cause for "lag" in general can be attributed to a wide variety of things. Faulty equipment, interference on your wireless network, a poor connection to your wifi network, a temporary routing/peering issue, or even simple traffic congestion. For example, at peak hours when most people get home from work get on the internet, you'll notice your internet performs slower than usual if your ISP did not add enough capacity to support everyone and has oversold their network. 1) Determine if only specific things are laging. For instance, if RC-RP is lagging, do other servers/sites/programs that rely on the internet get affected by this as well? If nothing else lags and you are certain of it, then it is more than likely a routing/peering issue to our server. In which case, see the bottom of this post to get the escalation path and steps for that. 2) Are you on WiFi? If so, connect via Ethernet if possible to see if the problem persists on it as well. WiFi is not known for being consistent and lag-free. It has many problems like interference, varying signal strengths which contribute to slowness or lag and intermittent desync. 3) Is there specific times of the day that the lag occurs on? I.E; Is there pattern in the lag? You should also ask yourself: Is my family or roomate using Netflix while I'm lagging? In other words, if your roomate/family is hogging up your bandwidth on your internet, your connection to our server will suffer as a result. A traceroute is a tool to show the path between you and our server. It shows things like latency (using RTT), timeouts and potential routing problems along the way. To read a traceroute, you only need to understand the format and meaning behind it. Tracing route to Cisco.com [72.163.4.161]. = This simply just shows what you are running the traceroute to and what IP address cisco.com resolved to. Each "hop" is numbered by its own line. The first hop would usually be your router in your house. The IP address inside of the brackets at the end of a hop just shows what IP is assigned to the hop/router your traffic is going through. 1 = The hop number, in this case it is the first hop. 192.1681.1 = The address of the hop/router that your traffic is going through. Now the same can be said for most of the hops that remain, except for hop #10 and hop #17. If you take a close look at hop #10, you see an asterisk (*) where the second latency test would usually be. An asterisk (*) in a hop denotes that it has timed out, meaning either the server did not receive your packet, or it did not send it back. This can potentially indicate a routing issue. But note that this is not ALWAYS worrysome, some ISP's and peers completely block the ICMP packets that are needed to run traceroutes. If in doubt, run a traceroute multiple times. If a hop ALWAYS times out regardless of the destination, it's likely just blocking ICMP which means there is nothing to worry about. On the other hand, if it's only timing out sometimes, it can possibly indicate problems. If there is wild spikes in latency between the requests, take note of where these spikes start at. I.E at what point do they begin? Now if you notice, the top has wild variation between 10ms responses and almost 1000ms (1 second! ), so that would pinpoint the problem at the start. The very first hop is always your router (yes, the one in your house), so you should check the connection between your PC and the router itself. Either don't use WiFi, or swap out the ethernet cable. Rebooting can never hurt too! Another key thing in understanding traceroutes is understanding who owns or controls each hop or part of a network. As a general rule of thumb, things towards the top are usually within your ISP's network and are usually named appropriately. Things near the very bottom where it completes are owned by the server provider of whatever you are connecting to. Why does this matter? It matters because if there is a problem, you should forward it to the appropriate party. Notice that at the top you see ".rr.com" which indicates it is owned by RoadRunner (or now known as Spectrum), so if you saw timeouts on those, it would indicate it is a problem within your ISP's network. So! What to do if you notice timeouts/problems on traceroutes? - If the timeouts start at the first hop, it's a problem within your own local network. Reboot everything, check your ethernet connection, don't use WiFi unless you must, etc. - If the timeouts start midway through, it's usually a problem with your ISP itself. Talk to them over live chat or the phone. They may ask for the traceroutes. - If the timeouts near the end, or continue timing out until hop 30, it's potentially a problem with the server. In which case, make a ticket with the traceroute attached. 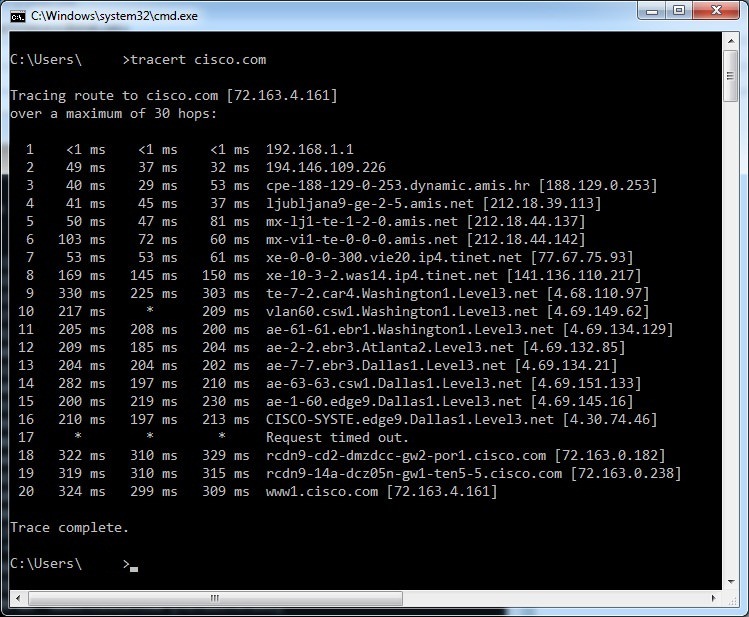 3) Type in "traceroute google.com" into the command prompt and hit enter. You may replace google.com with any other site you want if you're interested in comparing routes or pinpointing a problem. It goes over many things that I have oversimplified for your convenience, including naming conventions, asymmetric paths, MPLS, etc. That concludes the section on reading and understanding traceroutes. If you're completely unable to connect to the SA-MP or TeamSpeak server, running the traceroute tool I mentioned above is helpful in understanding why. But I will go over some additional problematic scenarios that can prevent you from connecting. In this case, check your computer for any firewall software, see if you are able to reach any other servers on SA-MP, or use a VPN with permission from an Owner in order to bypass any restrictions set forth by your ISP. B) Your DNS server(s) are not able to resolve our server name server.redcountyrp.com. Please see section 2.1 for troubleshooting this. D) You are using an unapproved VPN IP address. If you are on a VPN and cannot connect, you likely do not have permission from an owner to use a VPN. We block most VPN providers due to rampant abuse and ban evasion. 2) I am able to see the server and player count on my SA-MP client, but I get "Server didn't respond" when trying to connect. A) The most likely cause for this is censorship much like what I said above. Except it's usually more certain in this case since you're able to query the server but it times out upon joining. B) Windows firewall is blocking you from connecting to the server. You can try disabling it temporarily to see if it fixes the problem. The TeamSpeak relies on DNS as well and wouldn't work if your firewall (ISP implemented or otherwise) is restricting outbound connections. Let's do a Q & A style explanation for this section. A: In a nutshell, DNS is used to figure out what IP addresses that names resolve to. For example, a DNS server figures out that Google.com resolves to an IP like 172.23.11.5 (example) so that your computer knows what IP address to connect to when making a request. Q: How do I use DNS and how does it affect me? A: You use DNS constantly, you used it to get on this site, and your browser is probably making background DNS lookups at the very moment you're reading this. If you have a slow or non-responding DNS server it can lead to perceived "connectivity" problems or slowness with loading sites because your DNS server isn't responding in a timely fashion. Q: Cool! I'm convinced my DNS is at fault or I'm just a speed demon and I want faster internet. How do I do this? These are generally the ones everyone will recommend to use. They're almost always the fastest or most reliable. Q: How do I set Google DNS on my computer? Alternatively, you can use the .bat script inside of the .zip attached to this post to set your resolvers to Google DNS (You must right click -> Run as Administrator) We are not responsible for any issues caused by this, use it at your own risk. It was tested on most Windows OS'es and worked fine, however. If your DNS isn't working or serving you stale records, your server will be stuck at "Retrieving info" or your TeamSpeak will fail to resolve our hostname (ts.redcountyrp.com). In which case, it's always recommended to use alternate DNS servers like Google that will work more reliably. So you stumble upon issues with our UCP, forum, or any other RC-RP hosted site. Here's another Q&A style explanation of what to do and how to escalate your problem. Q: I've discovered a non-critical bug in your UCP or forum, how do I report it? Q: I've discovered a vulnerability in your UCP or forum, how do I report it? A: Please create a ticket or message an owner privately about this. Q: I'm getting random server errors when trying to browse to specific pages or perform specific actions (e.g 500 error, 403 error), how do I report this? - Don't use WiFi unless you REALLY have to. - If you're on Comcast, god have mercy on your soul. Their quality of service varies wildly depending on where you are. Last updated 2/6/2018. Perhaps more to be added in the future.